Just a quick status update on the progress of the cube since my last post. On the hardware side there has been activity on two different topics. 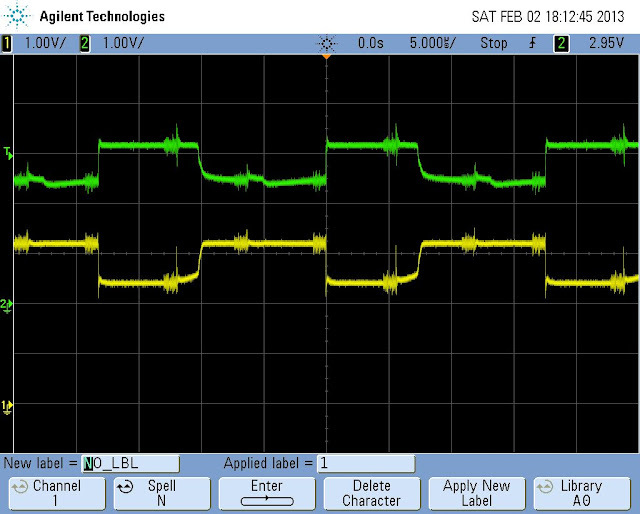 At first I had the opportunity to analyze my circuit and try to find out what's causing the ghosting effect at higher framerates using a friends oscilloscope. This involved getting comfortable with the usage and application of an oscilloscope in general and then trying to find out the different effects of different measurements and several different wiring variants of the transistors on the board. The last few days I've also been tingerking and thinking of how I could build the cube skelleton. I found no practical way to solder the LEDs together in a stable manner without adding additional wire. So yesterday I purchased a bit of iron wire and tried to solder the first layer. I drilled a few holes in a wooden plate, put the LEDs in it and soldered the LED pins together where possible. And I have absolutely no idea currently, what went wrong. Obviously another gap in soldering knowledge which I have to close when I want my next attempt for creating the LED grid to be successful.